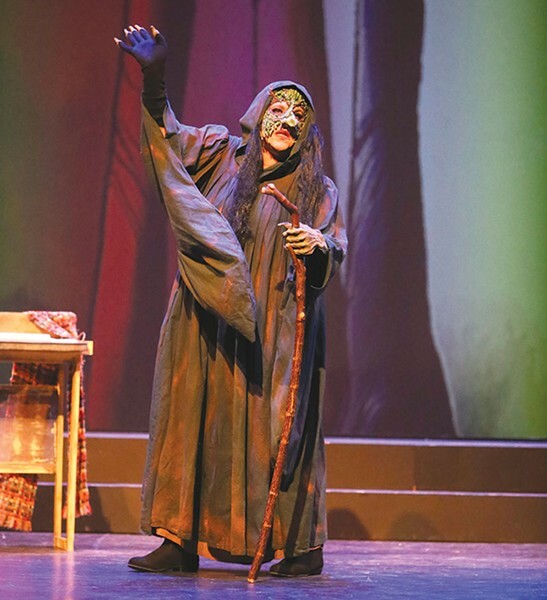 'Into the Woods' runs Thursday–Sunday through Jan. 17 at Spreckels Performing Arts Center. 5409 Snyder St., Rohnert Park. Friday–Saturday, 8pm; Sunday, 2pm matinees. $26. 707.588.3400. GOOD BAD WITCH Daniela Innocenti Beem is the moral authority in this delightfully dark fairy tale. A strong ensemble of North Bay performers, bolstered by uniformly fine singing voices, is the primary magic ingredient in Theater-at-Large's production of Stephen Sondheim's Into the Woods. Resurrected for a reprise run at Spreckels Performing Arts Center, this is an encore staging of the delightfully dark fairy-tale mashup that played to sold-out houses and rave reviews last fall in Novato. Such a plan worked out well last year, when Theater-at-Large brought its stellar rock musical Next to Normal to Spreckels for a repeat run. In this case, Into the Woods, while highly recommended for its musical prowess and stellar performances, seems a bit flat and theatrically undercooked compared to the pristine perfection of Next to Normal. In all fairness, though, that show is a high bar to match, and this one, directed again by Kim Bromley, does occasionally come close. The jaw-dropping beauty of the music—spun as if from a magic loom by a chamber orchestra directed by Debra Chambliss—and the fine singing and playful presence of the cast, will make audiences glad enough they came, even if the woefully straightforward staging and a few disappointingly clumsy transitions do come off as less than inspired. What seemed cozy and warm at the much smaller Novato Theater Company space, struggles to fill out the massive Spreckels stage, often swallowing the best efforts of the first-rate cast. As the sweet but conflicted Cinderella, Julianne Thompson Bretan gives one of many standout performances, and Krista Joy Serpa, as a fierce and funny Little Red Riding Hood, is a song-belting hoot. Also exceptional are Sean O'Brien and Alison Peltz as the show's childless protagonists, the baker and his wife, who launch the action with a scavenger hunt for magical items to reverse a witch's curse and give them a baby. Playing Cinderella's prince with a swashbuckling grin and a smarmy swagger, Anthony Martinez is wonderful, as is Johnny DeBernard, bringing a comforting presence and supremely clear diction as the mysterious narrator. And as the witch, the unexpected moral authority of this fractured fairy tale, Daniela Innocenti Beem is a force of nature, taking chances with the first part of the story, playing the witch for laughs rather than the usual menace, then morphing into a powerhouse of emotional strength and sheer vocal dynamite. Yes, some of the effects may leave you underwhelmed, but there's no escaping the forceful enchantment of this fine ensemble of actors, making merry magic with their mighty voices.